“Supergirl” was directed by Jeannot Szwarc, who is best known for directing “Jaws 2,” as well as a number of television shows in recent years (including episodes of “Supernatural” and “Bones”). 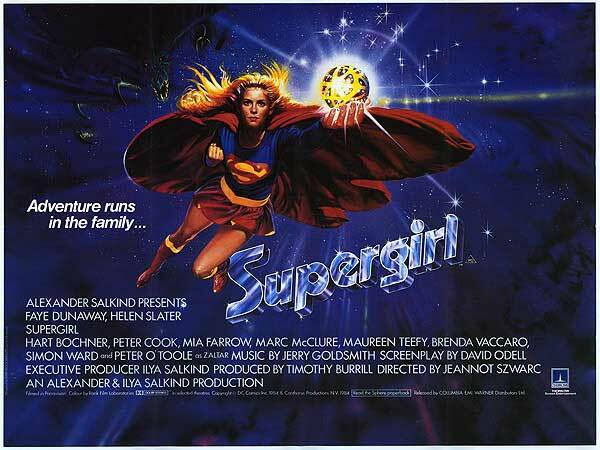 The script for “Supergirl” was written by David Odell, who also wrote the screenplays for “Masters of the Universe” and “The Dark Crystal.” His writing career on films understandably didn’t survive the 1980s. 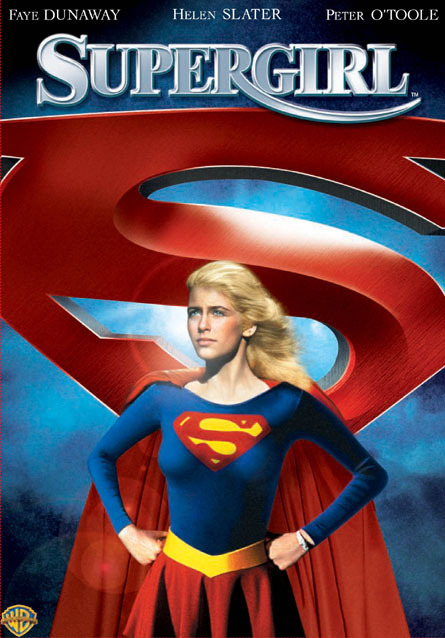 The effects team for “Supergirl” included Alan Barnard (“Krull,” “Indiana Jones and The Last Crusade”), Peter Biggs (“Who Framed Roger Rabbit?”), Brian Warner (“Superman,” “Hudson Hawk,” “Alien 3”), Ken Morris (“Willow,” “A View To A Kill”), Peter Dawson (“Gymkata,” “Batman,” “Full Metal Jacket”), Michael Dunleavy (“Event Horizon,” “Gladiator,” “Aliens”), and Ron Cartwright (“Space Truckers”). “Supergirl” features an impressively deep cast, headlined by newcomer Helen Slater in the lead role. The accessory cast includes such notables as Faye Dunaway, Peter O’Toole, Mia Farrow, Brenda Vaccaro, Peter Cook, and Marc McClure (reprising his role as Jimmy Olsen from the “Superman” movies). The story of “Supergirl” follows the hero as she leaves her home in search of a mysterious lost energy source, which she tracks down to Earth. While hunting it down, she has to learn how to adapt to human customs and blend in with the world. “Supergirl” is, in fact, canonical with the famous “Superman” series of films starring Christopher Reeves, and iterations of the screenplay intended for him to appear as Superman in either a cameo or supporting role. With DC recently relaunching a combined cinematic universe, it may just be a matter of time before Supergirl gets another chance at a big screen adaptation. Currently, there is a CBS television series being created around the character, which may or may not ultimately tie in to the cinematic universe. Interestingly, two distinct cuts of “Supergirl” exist. One is an “international” director’s cut that only premiered on home video years after the movie’s release, while the other is a significantly trimmed version that was theatrically released by TriStar after Warner Brothers shelved it. 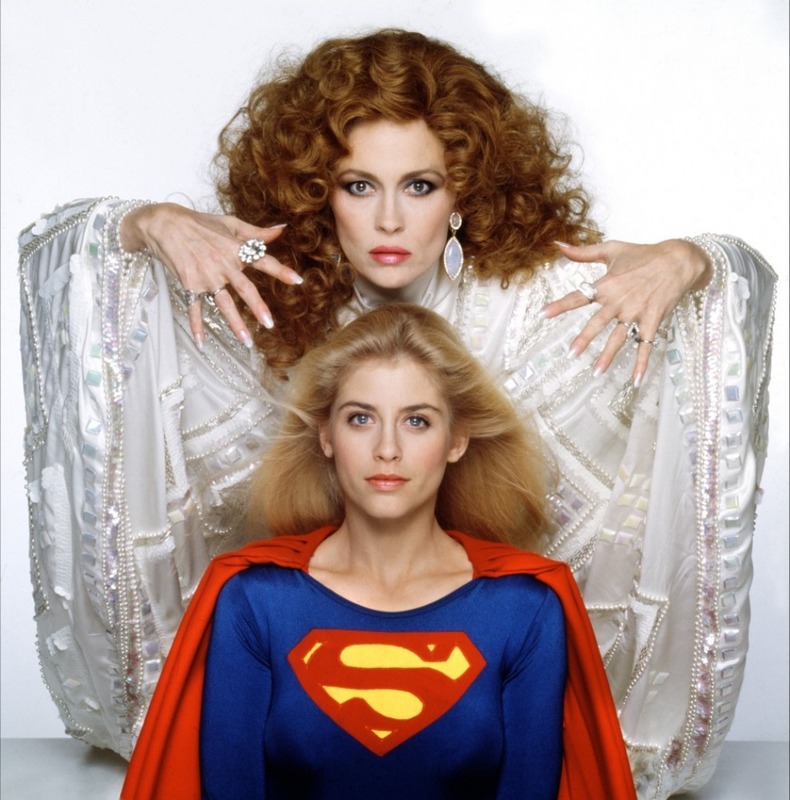 The casting pool for the character of Supergirl apparently included notables such as Melanie Griffith and Brooke Shields, which makes it all the more impressive (and perplexing) that it ultimately went to an unknown name. Likewise, the character of Selena was pitched to Dolly Parton, Jane Fonda, and Goldie Hawn before it was ultimately (and infamously) taken on by Faye Dunaway. The screenplay for “Supergirl” reportedly had to go through a good number of rewrites, each with drastic story differences around the inclusion and exclusion of specific characters. One of the producers (Alyssa Cartagena) was apparently so unhappy with the script’s final form and the production as a whole that she was ultimately dismissed from the film, which was probably better for her in the long run anyway. 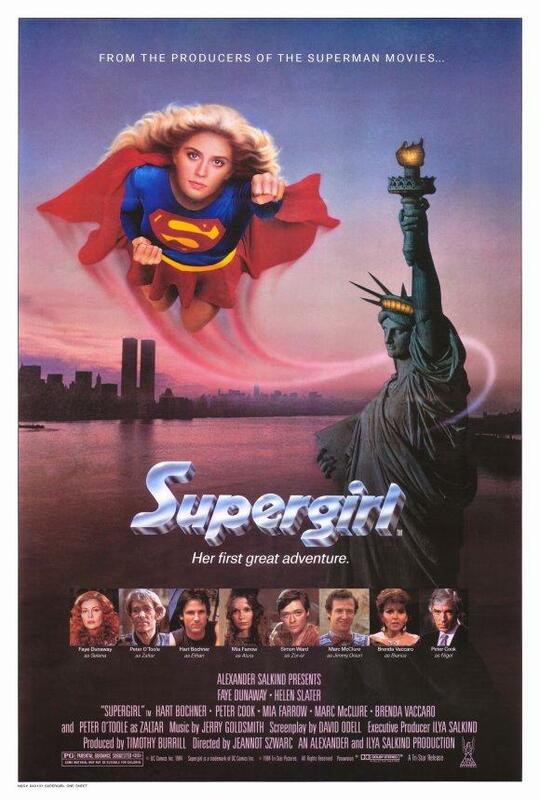 The original theatrical poster for “Supergirl” famously (and hilariously) features the Statue of Liberty in the background, holding her torch in the wrong hand. Of course, that is the sort of attention to detail you can expect from one of the worst regarded films of the 1980s. The character of Supergirl was created in 1959 by Otto Binder and Al Plastino, and is an immensely popular character in the DC universe. Much like Superman, she is a surviving Kryptonian who is given similar powers to Superman while on Earth. Unlike her film version, however, she has developed a good deal of depth over the years, and has gone through a number of reboots and character shifts. 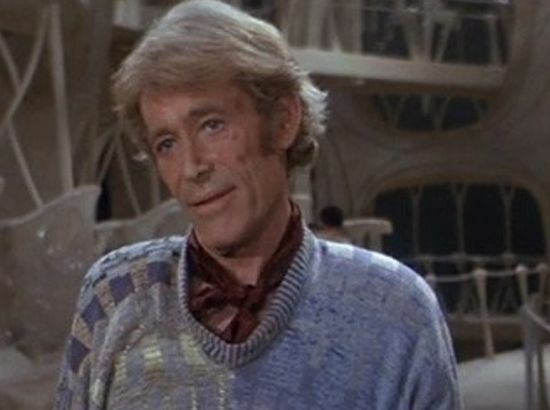 The reception to the “Supergirl” movie was incredibly negative, and the film was nominated for two Golden Raspberries for Faye Dunaway and Peter O’Toole’s performances as the worst of the year. The movie currently holds Rotten Tomatoes ratings of 7% (critic) and 26% (audience), as well as an IMDb score of 4.3. “Supergirl” had a lifetime gross of just over $14 million in its theatrical run. However, the budget was estimated at $35 million for the picture, making it a significant financial failure when all was said and done. The biggest problem with “Supergirl” by a significant margin is the writing. 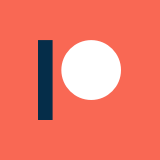 The dialogue, the plot, and the characters are all just awful, and it is frankly amazing that this was the product that resulted after five re-writes. Particularly, all of the women come off as excessively simplistic and infantile, specifically Dunaway’s Selena and Supergirl herself. I’m not sure if the characters were intended to be funny, but the way they are written just doesn’t work at all. As much as Dunaway was disparaged for her work in “Supergirl,” she actually seemed like a strong point for me, if for no other reason than she put some intensity and passion into the ridiculous role. Overall, “Supergirl” suffers a lot not just from the writing and acting, but also from some incredibly slow pacing, which is a problem that can kill any film that would otherwise be entertaining. The highlights of the film are probably worth looking up, but in general it is far too slow to be an entertaining watch. Faye Dunaway is about the only saving grace to the film, and her absence is notable when she isn’t on screen. For bad movie lovers, “Supergirl” is probably worth giving a shot for the experience of it, and for the highlight moments. However, general audiences probably won’t want to hang around for the whole trainwreck, and could very well doze off somewhere in the second act.